This stackable Bluetooth Shield allows your Arduino to communicate over wireless Bluetooth as a master or slave. 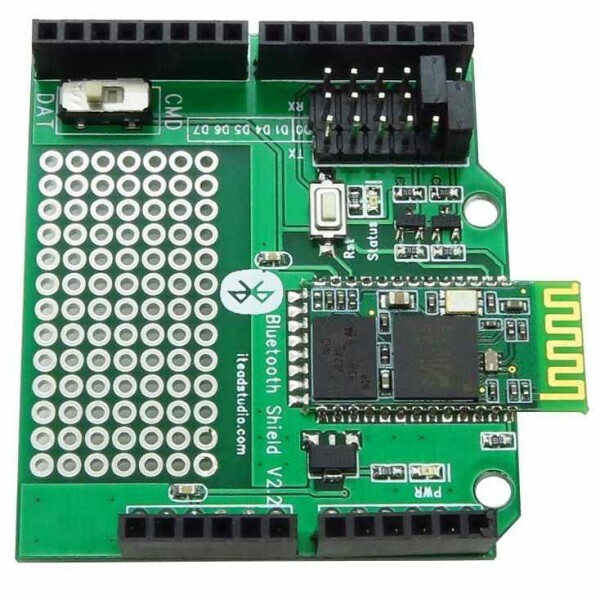 This Bluetooth Shield features an integrated HC-05 Serial Bluetooth module that provides BT SPP wireless serial communications. 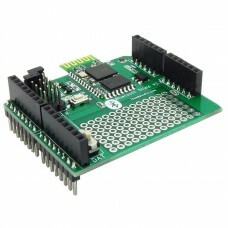 Choose a pair of Arduino digital pins from D0 through D7 by changing a jumper selection. The Arduino digital ports D0 and D1 are hardware serial ports whereas D2 through D7 can be used as software serial ports. An onboard PCB antenna allows communications up to 10 meters (more than 30 feet) when indoors and unobstructed. Use this Bluetooth Shield to interact with your robot remotely or allow your collection of robots to communicate with each other.